LynAnn Mastaj, D.M.D., has earned the distinction of having won many awards and titles of merit. She has also earned a reputation for being one of the region’s—and, in fact, the world’s— premier providers of Invisalign, an orthodontic treatment that straightens teeth using customized, removable and virtually invisible aligners. Although she commonly treats young adults and teenagers at her private practice in Bryn Mawr, she has seen Invisalign become an increasingly popular option for men and women in their 50s, 60s and beyond. 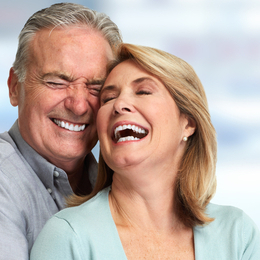 In fact, among all her Invisalign patients, those who are 50 and older represent one of the fastest- growing segments. Janis Nadler can attest to that fact. A Realtor and associate broker with Berkshire Hathaway HomeServices/Fox and Roach Realtors in Haver- ford, Nadler has been working in real estate for 34 years. In other words, she knows all about the value of “curb appeal.”? Although Nadler initially thought her or- thodontic treatment would be isolated to her bottom teeth, Dr. Mastaj recommended Invisalign for all her teeth. Nadler took the doctor’s advice, and she’s glad she did. Likewise, aesthetics were an issue when Linda Baris first came into the care of Dr. Mastaj. It was July 2015, and Baris wanted to have a crown placed after years of having gone without; she had made the selfless decision to put toward her children’s college education any money she would have spent on the crown. She admits to having been self-conscious about the missing tooth, even though it was not visible, yet her concerns went beyond matters of appearance. “I was ready to have the crown put in, but things had shifted to the point where the space needed to be opened up,” says Baris, a graphic designer based in Havertown. “I also have sensitive gums, and I liked the idea of Invisalign being gentle and gradual. I could have another year or so till I’m done, but I never felt any pain [with the Invisalign aligners]. Her point is an important one, as periodontal disease has been linked directly to serious health issues. Numerous sources, including the International Journal of Adult Orthodontics and Orthognathic Surgery, suggest crowded teeth contain more species of periodontopathogens present in subgingival plaque, which, in turn, can contribute to cardiovascular disease, stroke and other life-threatening health conditions. For Lisa Rhome, Invisalign helped address a health issue of a different sort. For nearly two years she coped with a rare condition known as burning mouth syndrome, which is characterized by chronic or recurrent burning in the mouth without an obvious cause. Rhome sought out a number of prominent medical institutions to soothe the pain, but to no avail. When she met with Dr. Mastaj about straightening her crooked bottom teeth and widening her “narrow” smile, the doctor suggested Invisalign for Rhome’s top and bottom teeth. The treatment led to a remarkable shift—not only in her teeth but also in the burning sensation. Of course, Rhome also has the winning smile she had been seeking. Having completed Invisalign treatment over the summer, and also having benefited from whitening treatments courtesy of Dr. Mastaj, Rhome says the people closest to her have noticed a difference. Lastly, there’s Maria Chila, D.M.D., who runs a respected general dentistry practice in Ardmore. She’s a longtime friend and referring doctor of Dr. Mastaj, so when she needed orthodontic work of her own, she knew exactly who to call. Dr. Chila is hardly the only one who recognizes Dr. Mastaj’s many points of distinction. Last year, Dr. Mastaj became an “Elite Top 1% Invisalign Provider Worldwide,” an honor earned by fewer than 100 dental professionals across the globe. In outlining the honor, Invisalign cited Dr. Mastaj’s experience, knowledge and the sheer number of patients she has treated successfully. To complement Invisalign, Dr. Mastaj has adopted cutting-edge technology such as an iTero scanner, which eliminates the need for taking impressions and also improves turnaround time for beginning treatment. This technology works in tandem with ClinCheck Pro, an Invisalign software program that enables practitioners to make real-time adjustments directly on a 3-D model of a patient’s mouth. As a result, Dr. Mastaj maintains precise control over the patient’s final tooth position to ensure a successful outcome. “With every person who comes into my office, I always have a patient-first attitude, always with the best result in mind,” she says. “I have used Invisalign to treat teens and young adults, but I have also seen a tremendous influx of older patients, who are typically underserved in dentistry. People want to know what their options are, and I think that’s true whether they are 8 or 80. 976 Railroad Ave., Suite 100?